Kin of deceased dalit research scholar Rohith Vemula today demanded immediate unconditional release of 25 students and two faculty members of Hyderabad Central University who were arrested in connection with incidents of vandalism at the VC’s lodge and stone pelting on police personnel on March 22. “We demand immediate and unconditional release of all those who were arrested and sent to jail, and withdrawal of cases against them. 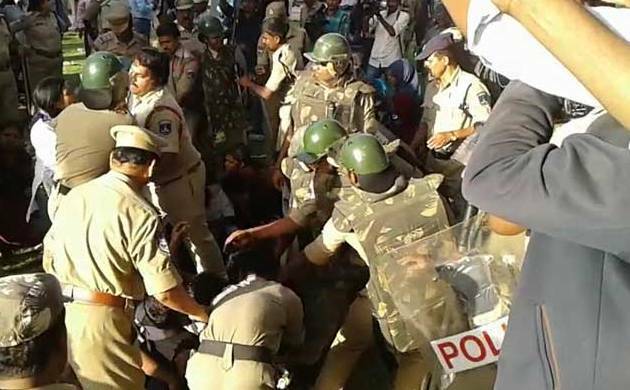 They (students) were asking for justice for Rohith (during the protest near VC’s lodge)...but were beaten up brutally by police,” Rohit’s mother Radhika and brother Raja, along with certain teachers of HCU and parents of some of the arrested students, told reporters. They also sought immediate arrest of HCU Vice Chancellor Appa Rao Podile, stating that there was a case registered against him for abetment of Rohit’s suicide. “A case is already registered against Appa Rao and how can he resume his duty? Over two months have passed since registration of the case, but no one has (either) been questioned or arrested,” Radhika said, adding, cases were registered against students who were arrested and jailed. “How many more days we have to wait for justice for Rohit? “Union HRD Minister Smriti Irani calls Rohit a child in Parliament, but she and the BJP government (at Centre) is not listening to and considering our requests seeking action against those responsible for Rohit’s death,” they said. “...If I question government, will I be called as anti-national...prove that I am ant-national,” Raja asked. P Anupama, a faculty member of HCU said, “We the concerned teachers of HCU are extremely distressed at the recent turn of events on the campus.” She said Podile’s return to the campus on March 22 to resume duties has come as a shock to majority of the varsity community. “We demand release of all arrested students and faculty and withdrawal of charges. The police must be immediately asked to leave the campus and we demand independent enquiry into the incidents that happened on March 22,” Anupama and other teachers said. A local court has posted the hearing on the bail pleas of the arrested students and the faculty members on March 28.